We live in a reality that more and more vividly reveals the fragmentary essence of our perception of the world. A conditional fragment of the ‘imagery’ space is replaced by a digital moving image- a record of reality . Are the fragments through which we perceive the present a portal to our perception of what is beyond our present? A video of a wave is played on the screen. It crashes on the Black sea shore just in front of a person that matched one of the few painted by Udo. 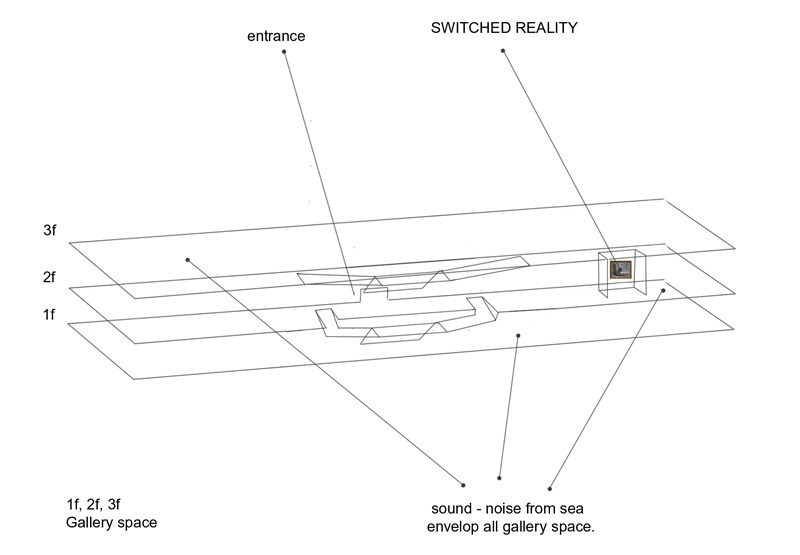 There is a hidden sound system dispersing sounds from a roaring North Sea, which envelopes the whole gallery space. The figures from Normandy and the video appear one above another creating a switch between the geographic places, ‘realities’, medias, etc., which overlap in the viewers mind. 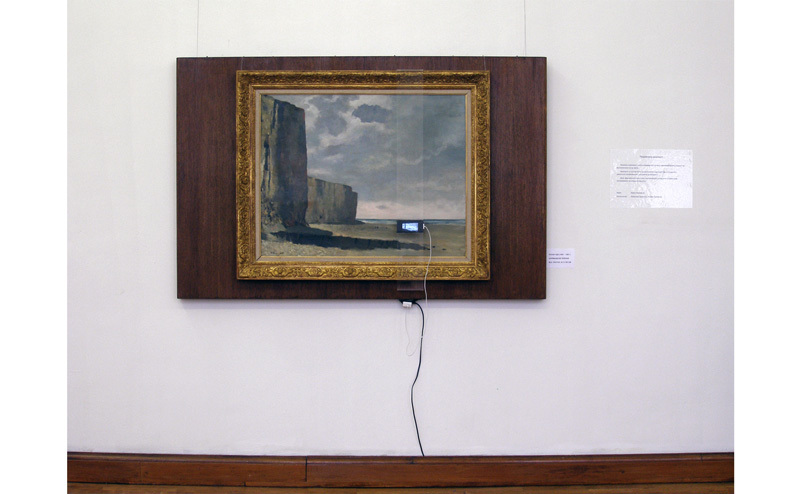 The work comprises of a small video screen attached to a tiny Plexiglas sheet. 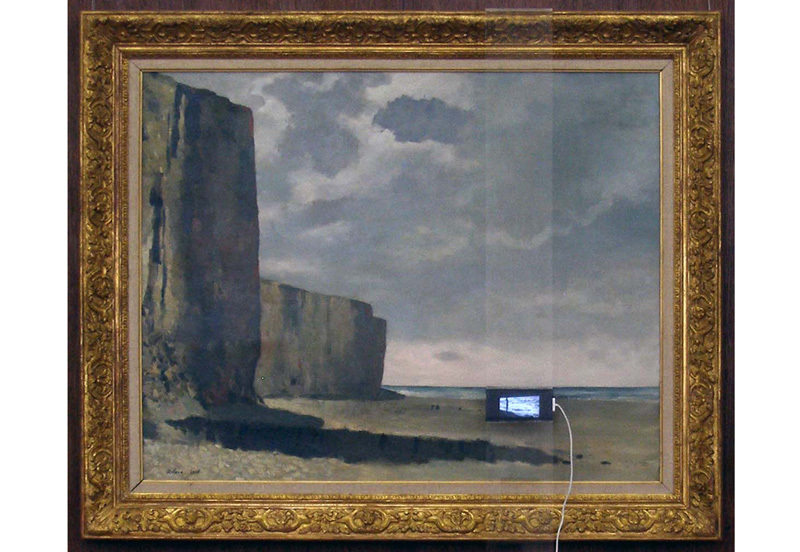 The screen is placed at 12 cm distance from the canvas, right in front of a small figure from the Udo’s painting, which stands on the coast and stares at the see. Key components: Seascape from Normandy, oil on canvas, Rolan Udo 1897-1981, painting from the collection of The National Gallery of Foreign Art, Sofia, BG; 3 seconds video, plexiglas, digital monitor; empty hall; sound(noise) from the North Sea which freely passing through the entire gallery space.